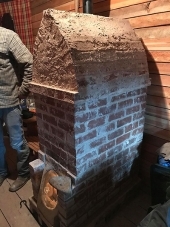 I'm totally new to the subject, but I'd like to try to build a Rocket Stove Heater for my Pole Barn Workshop. The primary reason for joining your Forum is to ask if you see anything obviously wrong with my intended design. I plan to weld a 4"x4"x 1/4" thick horizontal steel tube approximately 18" long as my Burn Chamber to a 4"x4"x1/4" thick vertical steel tube approximately 32" to 36" long as my Heat Riser. I will weld another "somewhat vertical" 4"x 4" x 1/4" steel tube about 12" from the truly vertical Heat Riser for my slightly angled Wood Feed Tube. All of this will be inside of a circle of Landscape Pavers that create an inside diameter of approximately 32" and an outside diameter of about 44". They are stacked 13" high which creates a very nice "Fire Ring". I will then fill the "Fire Ring" with loose Perlite to a height of about 10". Now I will put a 30-Gallon Steel drum upside down over the vertical Heat riser and cut a hole for the heat riser to protrude upward through the drum. I'll fill the drum with loose Perlite for insulation around the Heat riser. There will also be a Steel Shelf for the fuel which also makes an air supply channel in the Burn Chamber. Now I'm going to turn a 55 -Gallon Steel Drum upside down over the 30-Gallon Drum and heat Riser to act as my radiating "Heater" with a 6" Steel Stove Pipe as my Exhaust located about 15" above the bottom of the drum. I hope a space of about 2" or 2 1/2" between the Heat Riser and the bottom of the 55-Gallon Drum will be correct. 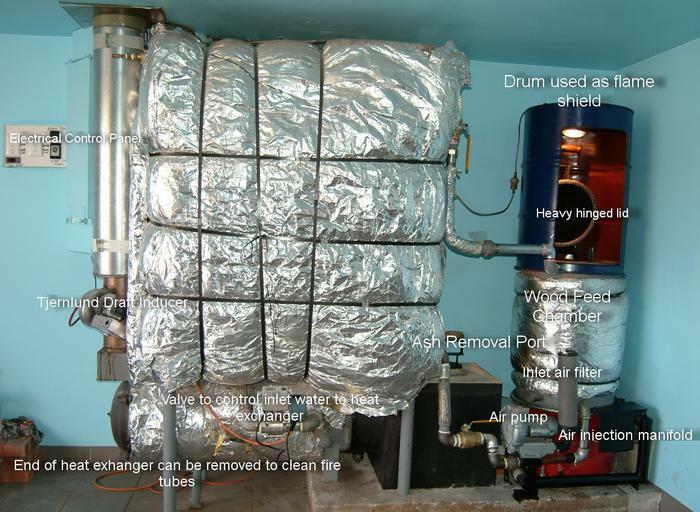 If all of this works satisfactorily and I get a true Hot Secondary Burn, I will probably add a Thermal Storage Mass around the exhaust Stove Pipe at a later date. I know the 1/4" thick Steel Tubing will burn away eventually, but the few times I will be using it each year it should last quite a while. Please let me know what you think of my intended design. All of the knowledge and experience you have shared with everyone in this Forum is quite admirable. Thank you very much for sharing. 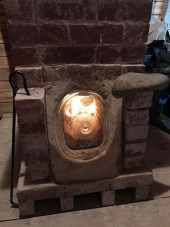 Someone Really needs to create a thread that actually DEFINES exactly what attributes a rocket stove has to have to bare the name because there are alot of builds out there that do not fit the bill but people attach the Rocket name to a stove that doesnt come anywhere close. 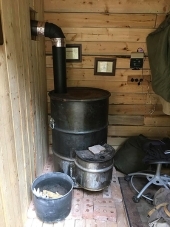 just building a metal J style passive air draw stove does not mean its a Rocket Stove. 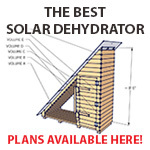 If you truly want to built a real Rocket stove, there is also a book that can help you with your creative Rocket Stove desire. Could this be a lead? Basically steel stoves will burn out. It sounds as though what you actually want is a Rocket Mass Heater, not a stove. I don't know if anyone has tried it, but a simple alternative to the couch based RMH is one that is snaked inside a workbench/island. I don't need a couch in my shop. Another option that might work in my shop if it wasn't already built would be a standard RMH structure, except rather than just snake the post drum tubing inside a couch, snake it in a trench across the floor and then up and out a chimney. My shop is 60 feet long but about 14 foot wide, so it would only need to be 14 feet wide which seems plausible. Basically it is to reduce the wasted space by pulling the heat diffusion into the floor. The RMH has the advantage that it works. But there is a desire to have the metal tube based systems, and I think the best way to pound a stake into them would be to come up with a way of making them that would work. Some way of lining the tubes, or all ceramic, I have no idea, but the need is out there, the designs are not. 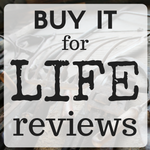 There are some well regarded steel rocket stove mad scientists out there. 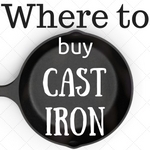 One feature they have is serial stove manufacture, constant innovation. You have to wonder if that isn't how they are avoiding the consequences of a bad design, they never keep one around long enough to see it fail. The most intriguing steel rocket heater I have seen is the wiseway. I don't know if it will work long term, but people claim to have been heating with it for a while. Because the steel is angled, maybe the heat does not get up to the 3K deg F range that is melting stoves in other designs. But I have no experience. Wiseway, also makes BBQs, and they are certainly going to burn out, but the fact BBQs are not run for long may be their salvation at least as far as useful lifespan is concerned. Likewise, in a shop, I can pay the ongoign heating costs, what really kills is taking the initial chill off. A stove that would burp some heat would help a lot. The Kelley kettle has a few of these feature: vertical burn tunnel, stainless, and occasional use. I have built several forges that are steel lined with wool and ceramic slip, and they reach forging temps and the steel is unaffected. There may be a solution possible, but so far the right people aren't looking. 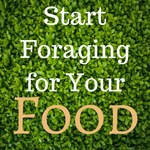 New to the forum, been reading, still have some questions.